This entry was posted in Writing and tagged authors, cathedral, editing, editing tips, fiction, first draft, goodreads, latimes, learn to write, less is more, los angeles times books, new york times books, nytimes, Raymond Carver, short stories, short story, writers on writing, writing, writing advice, writing quotes, writing tips. Bookmark the permalink. Great post. While the word processor has pretty much ended composing in longhand, it probably is still the best method for organizing thought. When “blocked” I will print out the pages leading to the snag, grab a pen and legal pad and move far away from the electronic jungle that my personal space has morphed into. For me, gazing at a yellow sheet of ruled paper is somehow less intimidating than staring at a monitor screen. longhand was my love this past summer. i wrote several letters and short stories. Now the book i have is around 130 pages of assorted material. 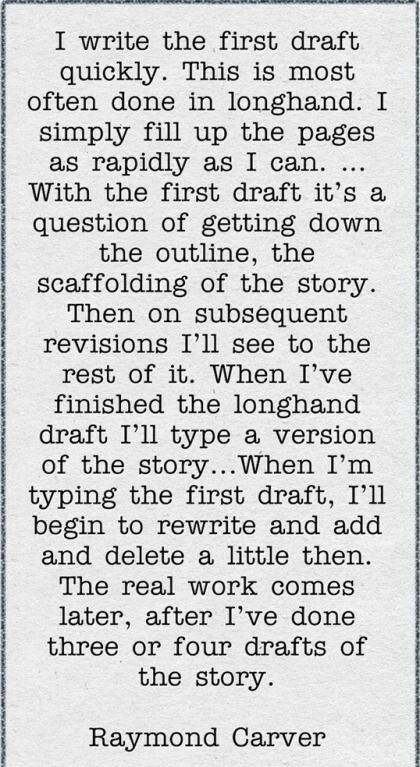 This post describes the horrible truth of writing! Great reminder! Thank you, Brian. Nice example. But isn’t it a shame that less is more, when one so dearly loves to write and write and write? I was heart-broken as a youngster when I first heard the phrase, “a picture is worth a thousand words”! And, rixlibris, there are still plenty of us, I’m sure, who write portions of stories in longhand as they compose drafts and story bits. I do. Although, many youth in America these days aren’t even being taught to write in longhand. They, certainly, will be all about the computer writing. I can’t imagine not learning to use cursive. As a youngster, I was fascinated by that process — stringing letters together to make words, etc. — by my own handwriting.